When Maria and Tony Iannucci began to look for property and the lifestyle change that would come with it, they knew they’d found it at the five-acre Lake Wales site now known as AM Acres. The couple’s dream site and its activities have surpassed fresh breakfast. On Easter Weekend, their goats had already gifted them 25 kids. They were welcomed, just like the other living creatures who take up residence there. The couple raises registered Oberhasli dairy goats and Black Copper Maran chickens. And there’s one Jersey cow — Tilly. The goat population is at 50, and they have the run of secure pastures during the day. They go to the barn at night after feeding and milking. The 30 resident chickens are free-range and go into their coop at night. That protects them from predators, such as raccoons and coyotes. 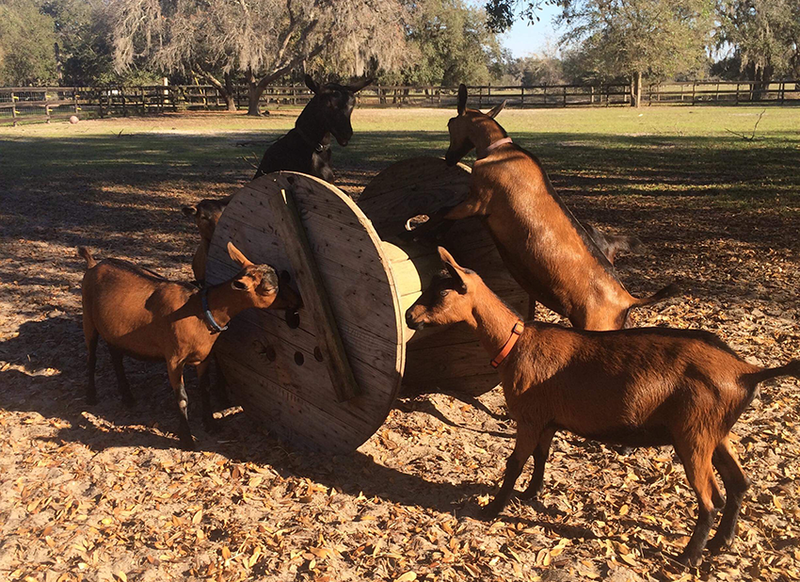 AM Acres started out with three goats in 2010 and a dozen chickens in 2010, the year after the couple purchased the property. On the contrary, she says. “They are actually somewhat delicate and require maintenance to be at optimum health and thrive.” In Florida, the soil is deficient in some minerals that goats need. Supplements are therefore required, along with diligent parasite control. People may have the conception that goats can be put in a pasture and just hang out and keep the grass low — along with food and water. But goat “parenting” involves much more. “It is a ton of work,” says the admitted goat lover, an exuberant personality who is quick to smile and welcomes adventure. She is clearly a natural at caring for her small farm animals, upon whom she is not averse to bestowing considerable affection. There’s more to it than work; there’s the fun. Even though there are so many on site, she gets to know them individually. “The Oberhasli breed all look the same. They are brown with black markings. But each one is loaded with personality,” she says. Tootie and the gang need quite a bit of care. May as well say it; it’s impossible to resist: She’s not kidding. AM Acres grows a garden, fresh fruits, and vegetables without using herbicides or pesticides. Mostly heirloom seeds are planted when they are available. Most small farm owners are not knee-deep in dirt and feed sacks for the financial rewards. AM is no exception. “We sell some of our product to help manage the feed bill,” Iannucci says. “We sell at farmers markets in Polk County, as well as direct from the farm by appointment,” she says. AM Acres has a permit that allows the sale of milk for pet consumption. In addition to fresh goat and cow milk and eggs, the farm makes farmstead cheeses, such as chevre, mozzarella and feta, yogurt, kefir, and ice cream. It’s also neat to share how the farm works with others. Especially if they’re visitors who wouldn’t be opposed to picking up a chore or two while there. “We welcome those interested in volunteering to come see what it’s like,” she says. The journey of AM Acres over the last nine years has shown what having a passion and joy for what you’re doing can lead to. What started out as land with a couple goats and chickens has turned into a five-acre home filled with a large and loving livestock family. *The term “kidding,” in the goat world, means giving birth.